Powerful Hurricane Irene battered the Bahamas on Wednesday on a track to the North Carolina coast that forecasters say could threaten the densely populated US Northeast, including New York, starting on Sunday. Irene, a major Category 3 storm with winds of 195 kilometers per hour, pounded the southeast Bahamian islands with winds, rain and dangerous storm surge. Tourists fled the storm and major cruise lines canceled Bahamas stops. The first hurricane of the storm-filled 2011 Atlantic season was expected to gain strength after it leaves the Bahamas on Thursday and race across open waters to clip North Carolina's jutting Outer Banks region on Saturday. After that, forecasters see it hugging the US eastern seaboard, swirling rains and winds across several hundred kilometers as it churns northward toward New England. ¿Puedes localizar a Wall-E en la imagen? ¿E identificar a los otros robots? Edita el mapa, y ayuda al resto de usuarios a identificar los robots que conoces. Ya hay más de 20 identificados. For 2011 Mississippi has claimed the title of fattest state for the sixth consecutive year, while Colorado continues its streak as the leanest. 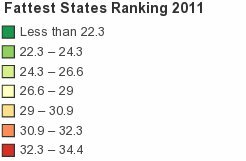 Maine rose the most places in the rankings over last year, while Oregon dropped the most, according to a new analysis by CalorieLab, Inc. This map shows United States of obesity: 2011 Fattest States Ranking. Rankings were computed by CalorieLab based on a three-year average of state-by-state statistics for adult obesity percentages from the CDC's (Centers for Disease Control and Prevention) Behavioral Risk Factor Surveillance System database. Obesity is defined as a BMI of 30.0 or over, overweight as a BMI of 25.0 to 29.9. Standard & Poor's (S&P) is a United States-based financial services company. It is a division of The McGraw-Hill Companies that publishes financial research and analysis on stocks and bonds. It is well known for the stock market indexes, the US-based S&P 500, the Australian S&P/ASX 200, the Canadian S&P/TSX, the Italian S&P/MIB and India's S&P CNX Nifty. It is one of the Big Three credit rating agencies (Standard & Poor's, Moody's Investor Service and Fitch Ratings). 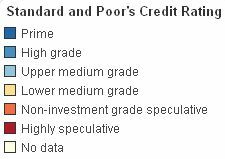 This map shows Standard & Poor's Credit Rating for each country.